In the face of the Great Recession, Whites, Asians, Hispanics, and Blacks have experienced a loss in median household net worth since 2005. But U.S. Census figures show it is minorities who have taken the biggest economic hit, with the gap between them and whites nearly doubling in just five years. Asians, Blacks, and Hispanics saw their net worth shrink nearly 60% in the years between 2005 and 2010, while Whites’ net worth shrank 23%. The real numbers are even more painful to contemplate (as the above CNN/U.S. Census Chart shows). Whites have a $110,000 worth while at the other end of the spectrum Blacks have under $5,000 net household worth. 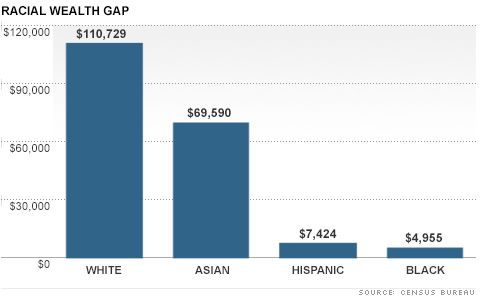 Asians and Hispanics have, respectively, just under $70,000 and just under $7,500. Both Hispanics and Blacks have more of their money wrapped up in home equity — many of them bought homes right before the housing crisis, and did so using subprime loans, a particularly harsh, high-cost financial method. Pew Research found that in 2005, Hispanics had nearly two-thirds of their net worth committed to home equity, while Blacks had nearly 60% of theirs so invested. Whites had far less, 44%, invested. Then came the housing and bank crisis, and while everyone took a hit, minority families saw their main investment, home equity, fall to less than half its value overnight. The difficulty — for Blacks and Hispanics in particular — is that with far less wealth to start with both groups have a much harder time putting wealth to work to create more wealth. Instead it is the old “money in, money out” scenario, and when the economy tanks they are far more exposed. Two other factors also play into the mix. Those with less money to start with are less likely to diversify into things such as stocks or other forms of investment. And they are also more likely to be unemployed as the recession drags on. Currently, while Whites suffer a 7.4% unemployment rate, Hispanics suffer 11% and Blacks 13.6% unemployment. From Race & Economics to Empathy & Suffering: What?! From a Christian point of view, how are we to think and what are we to do faced with the pain these figures reflect? It is vital for Christians of a pale persuasion (i.e., White folks) to deeply study the history of minorities in America. Such study is not about pity, nor about the discovery of some pristine ideological framework that will supposedly fix everything. It is about understanding just a little of why and how we in America are still struggling (as just one example) with the long-term effects of four to five hundred years of slavery followed by full Civil Rights for non-whites which has existed arguably only since the late 1960s. What are the ramifications of history? What can be done about the legacy of racism in America? What, specifically, do Christians have to offer? After all, our faith’s contributions to the abolitionist movement on the one hand seem counterbalanced by our faith’s propping up of Southern slave doctrines rooted in a radical misuse of (among others) the writings of Paul. Can we frame out a biblically radical egalitarian vision? Further, can we frame out a truly biblical economic vision that goes beyond merely a right or left rubber-stamping of the status quo? Can we find a way to share economically with one another? American culture says that our value is measurable by the amount of money our occupations make. But Scripture offers a different, other-centered, vision. Can the Church offer not just words, which of course are so important, but also action? Can we as Christ’s body embody a culture of sharing things in common? I do not suggest communal lives for everyone (even though this writer does live communally with other believers). I don’t think that is realistic. But I do suggest that there is a lack of imagination among Christians today, a lack of fire that allows a constructive anger at racial inequality to create a dynamic vision to right racial wrongs. Not all wrongs. Maybe just one wrong. Today. Specifically. Who do we know who struggles? How can we reach out to them? Money is nice. But often times, money is not the lone or even primary need. A job is better. Housing is good. Education — or opportunities for it — are excellent. Nothing worthwhile is easy or fun, at least not much of the time. The worst thing for a White person such as this writer in addressing racism’s effects is that one must sooner or later come into contact with one’s own preconceptions. Again, the pat-on-the-head “oh, you poor victim” pity thing… which is, of course, a highly self-delusional form of racism. Pity is not helpful. Empathy is helpful. And actions rooted in self-aware empathy are the most helpful. Empathy is about that rare and mysterious moment when we experience of loss of ourselves in coming into contact with the feelings of another. We *are* them for a moment. Their anger, their suffering, their resignation and despair, become our own. We do not pity them because empathy shoves pity aside as completely inadequate. Pity is, at its heart, a form of self-congratulation. “I am not like those unfeeling people who call folks of a different color names… I’m morally on the right side and will defend this poor victim of racial tyranny.” But empathy cries out in deepest sincerety, “Lord! She suffers! I suffer!” Empathy is a unique form of “knowing” beyond intellect. If we truly suffer with another, we are driven to one of two ends. First, we can do what most humans do, which is to step away from suffering, to seek out something comforting to divert us. To forget. Second, we can do the almost impossible thing, and embrace suffering as the language of commonality. “You suffer, I suffer.” And in that embrace we just might find that through Christ, Who alone suffers with all human kind, we are enabled to bring healing. Perhaps just to one person…. or perhaps to more. But it all begins with a decision…. the decision to embrace the other and the suffering of the other. In empathy. The biblical word for empathy is compassion. And we have to face something dangerous to ourselves in this compassion, namely, that if we so identify with the oppressed that we truly know their suffering, we may in fact suffer ourselves the same persecutions they suffer. Jesus empathized with Mary and the others’ cries of pain so much that, terribly affected in his inmost being, he himself wept. He identified with them in their sorrow completely. He was truly and wholly with them not just physically but emotionally. And then he acted and raised Lazarus… an impossible thing. It is this same Jesus that Christians belief identified with us so very much that he came to earth to share our humanity, to empty himself and take upon himself all the sins of the world. There is no adequate way to describe such a level of empathy. There is no adequate way to explain the level of action which this empathy led God’s Son, God in the Flesh, to embrace upon the cross. An impossible but true thing. But beyond us understanding Christ’s empathy (something we cannot do as it is beyond us), there is a level of empathy which says that if we love Christ we will take up our cross and follow him. And even the history-poisoned present of race in America is not safe from such a radical embrace.